Prickly and Bitter: Sandra's Garden: What's eating Gilbert Grape? Sandra's Garden: What's eating Gilbert Grape? 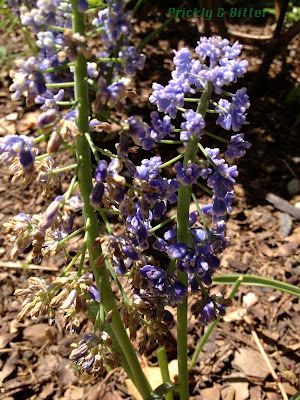 Grape hyacinths are wonderful little plants, if you're willing to put a wee bit of effort into keeping them tamed. Sometimes called bluebells (although not true bluebells), these plants are native to Europe from Greece to Turkey. They are planted usually from bulbs (although some cultivars do reproduce well from seed) and have a high likelihood to become invasive if you're not careful. Fortunately, they are not good competitors unless they are in full sun, so they, for now, are not invasive in natural areas. The easiest way to control their growth and prevent them from escaping your garden is simply by clipping off the flower heads once the flowers are spent and the fruit starts developing. There is usually a significant delay between the flowers dying and the fruit opening, so even if you miss the last flowers falling off by a couple of days you've still got some time to get your clippers out. Sandra has two different cultivars of grape hyacinths planted, which are quite striking beside each other in the garden. 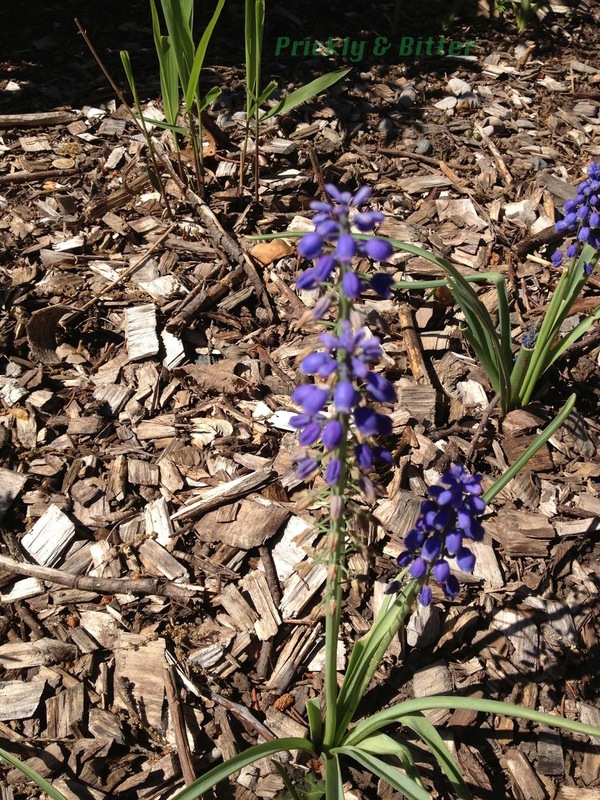 The first one is the "regular" grape hyacinth with the typical blueish purple bell-shaped flowers with the white border that is slightly frilly. 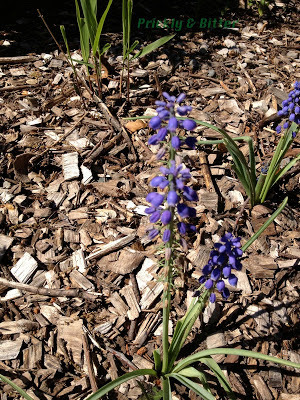 This would be the regular grape hyacinth that you would expect to see in the wild throughout its native range. These are also the kind that produce many, many seeds and almost all of them are fertile (so not only do they spread underground via their bulbs and bulbet production, but also spreading aerially via their seeds). 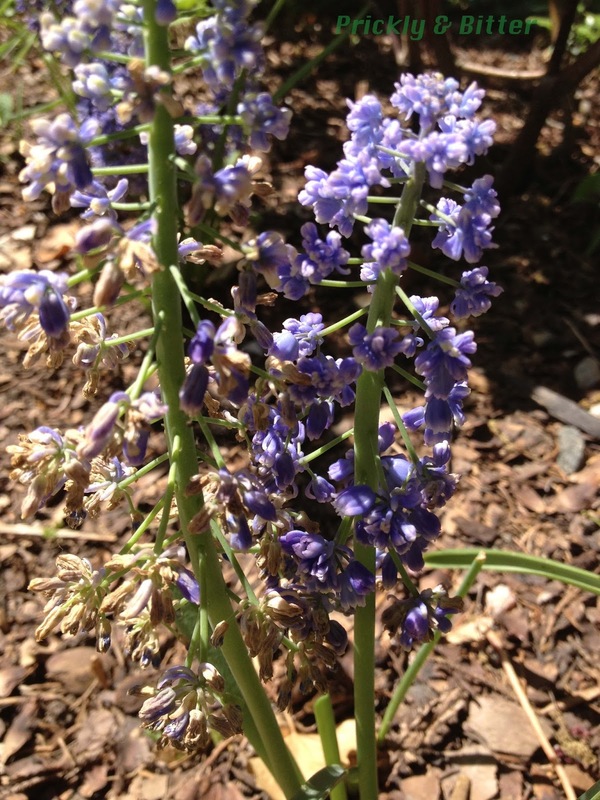 The second one is the doubled grape hyacinth, a cultivar selected to have double the flowers on the stalk. Whenever a doubled cultivar is created, it almost always removes the plant's natural ability to reproduce via seed production. This is great in the case of the grape hyacinth because it provides the same splash of colour at the same time as a regular grape hyacinth but you don't have to worry about it becoming invasive. Best of both worlds! Strangely enough, despite this being a popular garden plant, I can't seem to find any information on the toxicity of this species. Since it does grow from a bulb a good rule of thumb is not to eat it (onions and their close relatives like chives, garlic and leeks are the only bulbs that are reliably edible no matter what cultivar), and it's also probably a good idea to wear gloves since the sap that comes out of the bulbs when cut may be irritating to the skin. 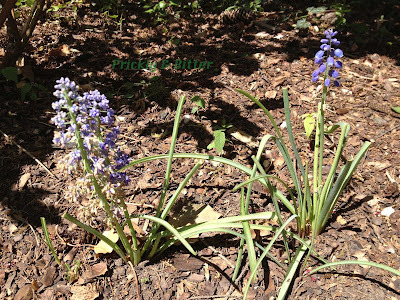 One great reason to plant doubled grape hyacinths in your garden if you live near a natural area is because of deer. 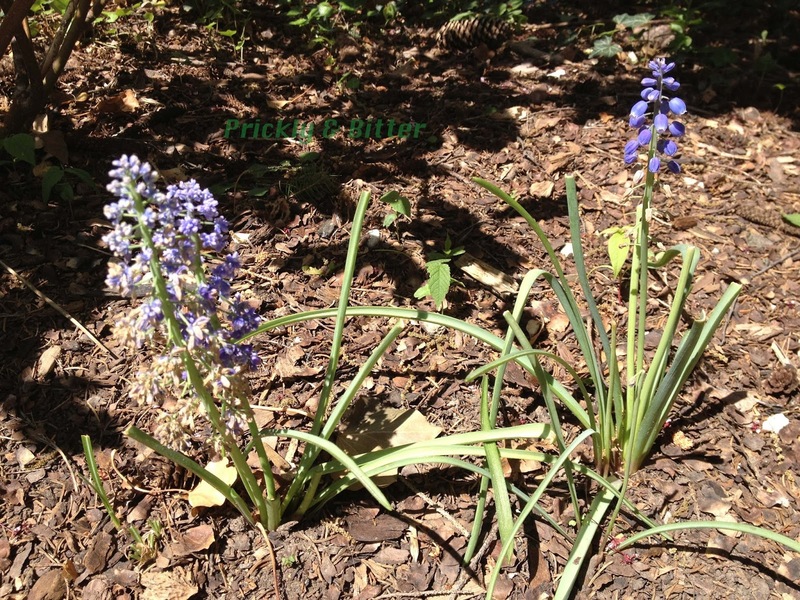 Deer absolutely HATE grape hyacinths, and will avoid other plants that are near them. If you have some prized flower bushes or a young tree that you want to protect from deer grazing, planting a border of these plants around them would work very well. Then when the deer are no longer interested (or when your tree is large enough to tolerate having some of its branches stripped of leaves and bark), dig them up and transplant them to a new area that needs protecting! Sandra's Garden: This hawkweed has spots!